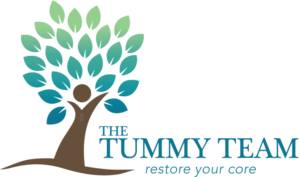 If you do not live close enough to come in for an individual session TheTummyTeam has GREAT online programs for Core Rehabilitation, Prenatal and Postnatal Rehab, and will walk you through Anatomy, Exercises, Splinting, Alignment, Stretches, and so much more! Postpartum Moms: Build a foundation before you go back to your regular exercises classes, planks, machines. After the marathon of labor … your doctor has released you at your 6 week checkup. Now what? You don’t feel the same … you don’t look the same … the world tells you that you should Super Woman up and start working out like pre-pregnancy, immediately, but you sense that your body may not be quite ready. This class is for you! You are correct – listen to your body! Come learn how to bridge that workout gap and get ready for your workouts safely but with great inner strength. Deep Core strength. Learn how to re-engage your core after your baby in everything you do, with good alignment and strong ab work. Not crunches, which will just make that remaining baby pooch worse, but ab work that will strengthen the whole “true core” canister in your body so that it will hold up to great workouts at the gym or outside. But more than that, this is not an exercise class, but rehabilitation and education…. We explore anatomy and learn about “true” core and what that is, diastasis, the pelvic floor, and incontinence and how it is all linked. Do you leak when you laugh or sneeze…do you know why or that it may be “common” but not “normal”? You don’t have to live that way. What to expect from this class: Education. Breathing, moving and the tools to become strong. Slowly. Without hurting yourself. With your whole core functioning together as a unit. Building a strong foundation from the inside out. This class might not make you sweat… but it will teach you mind and body connection that you can use so that you can go back to the gym and sweat with the best. a class for women 6 months and more postpartum. This is a women only, adult only class. Classes are only 1 hour for 5 weeks on Saturdays to accommodate new nursing mothers and babies. Healthy Exercises Right in your Own Home in your Timeframe! Bethany Learn and Fit2B! It’s an online gym in the form of a workout video library of almost 100 exercise routines (!!) including Pilates, Yoga, Pre-natal, weights, Tabata, functional cross training, stretching, ball workouts, relaxation, and more! ALL of the workouts are “Tummy Safe”. She demonstrates proper form in layman terms… and every single one of their workouts strengthens your abs! They focus on the transverse abdominus while also working the entire body in every exercise routine. Do as much or as little time as you like… any time of the day (or night for you night owls out there!) I LOVE this site… her routines are simple… yet can be intense – you choose … yet TUMMY SAFE!! Click here and explore Fit2B.Us. Do you know that for correct elimination we are designed to squat? If you have problems with elimination (constipation, etc.) 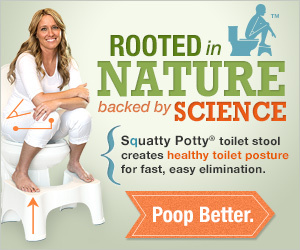 click on the picture and check out the Squatty Potty… it works!